A series of airfield improvements at South Bimini Airport (YBS) is making it easier for travelers to get to Bimini, the tiny pair of Bahaman islands located just 50 miles off the east coast of Florida. That's good news for beachgoers, sport fishermen and any other North or South American travelers who want to escape to a tropical paradise without spending a lot of time getting there. It's also good news for Bimini's overall economy and the local workers who were employed during the multimillion-dollar construction effort. During the days of Prohibition, Bimini was a popular spot for speakeasies and liquor stores, with rumrunners stashing their cash in its numerous cays. These days, it's attracting a different kind of business. Genting Group, a Malaysian conglomerate, began investing in the islands with the development of a 750-acre beachfront resort and casino on North Bimini, and then opened a similar property adjacent to South Bimini International Airport (YBS) - both under the Resorts World brand. Genting's South Bimini property boasts the closest offshore casino to the United States, and was mainly serviced by high-speed boat service from Miami when it opened in June 2013. With a daytime sea route in place, the resort owners soon turned their attention to facilitating 24-hour access to and from the island. YBS had daytime flight in place with Bahamasair, Silver Airways, Western Air and Flamingo Air; but its main 5,400-foot asphalt runway could not support nighttime traffic. The solution involved a two-phase initiative that included a 900-foot runway extension, solar LED airfield lighting and other support elements such as a precision path indicator system, windcones and an automated weather observing system. History was made last night when Ogle Airport received its first regional night flight when LIAT’s ATR42 made a flawless touchdown at 21.54 hrs with 17 passengers aboard from Trinidad & Tobago immediately following a torrential downpour that threatened to flood the Airport and postpone the historical occasion. Aviation Renewables has recently returned from Lao PDR after delivering, installing and commissioning two Solar Series LED PAPI systems at a private airport. With a particularly steep approach due to surrounding terrain, the client sought a solution that would increase the safety margin on approach, and guide pilots to the threshold at the proper height to land and stop safely on the relatively short runway. 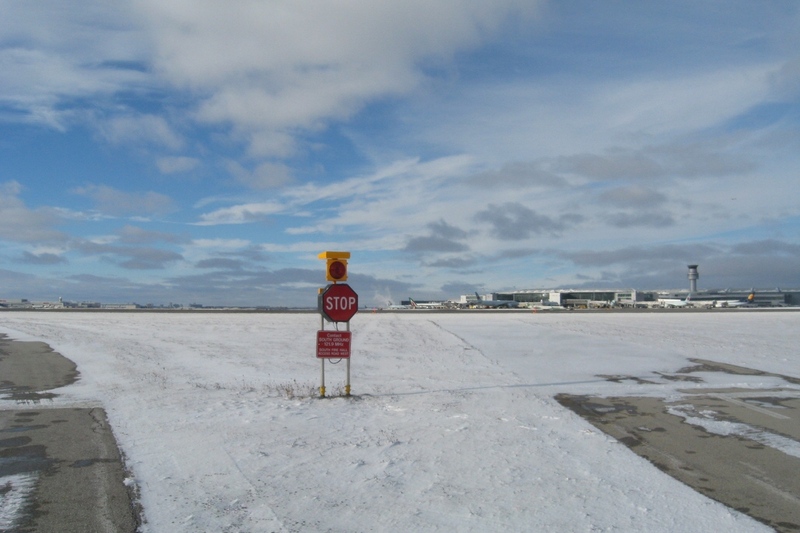 As an existing runway without any electricity service, the airport sought a solution that would allow the runway to remain operational during installation by avoiding the need to lay conduit and electrical wiring. Aviation Renewables has received two further orders to supply multiple units of the Solar Series LED Hold Position Lights (HPLs) and Elevated Runway Guard Lights (ERGLs) to a US Air Force Base and a general aviation airport in the USA. The Solar Series LED Hold Position and Elevated Runway Guard Lights will operate 24/7, greatly increasing safety throughout the airfield for moving vehicles and aircraft while eliminating the need for conventional power inputs, expensive infrastructure and daily energy costs. Aviation Renewables was able to deliver a self contained ready to install solution within 3 weeks in order to satisfy the urgent needs of both customers. With temperatures exceeding 45 degrees Celsius at the base during hot summer months, the Solar Series LED Hold Position and Elevated Runway Guard Lights have proven to perform in the most challenging conditions across bases in the Middle East, SW Asia, USA and the United Kingdom. Aviation Renewables delivers renewable lighting and power solutions to international airports, defense forces, humanitarian aid and private aviation users around the world. Aviation Renewables has delivered several dozen Solar Series LED Windcones to a defence force in the Middle East. Following a successful testing phase with two units, the client elected to order the full allotment of the quick-deploy portable LED windcones for both fixed wing and rotary wing use. To date, the Solar Series Portable LED Windcone has been extensively deployed by a wide range of military and civilian operators worldwide including NATO, US Forces, Humanitarian Aid Organizations and resource companies. As the most installed solar LED windcone in the market, it is also the most reliable wind cone in operation including its patented maintenance-free swivel with a proven lifetime of over 50 years. The unit is easily set up or stowed by a single person in a matter of minutes. It is easily transported by trailer, and breaks down into 5-foot lengths for easy handling and storage. The integrated solar power system allows the windcone to operate dusk to dawn in a wide range of climates, and has a proven deployment history on every continent. Aviation Renewables designed and oversaw the installation of a solar LED airfield lighting system at South Bimini International Airport in The Bahamas. The system features Solar Series LED airfield lighting solutions. With an urgent need to be operational, the entire system was installed and operational in less than 3 weeks time at a fraction of the cost compared to a conventional system. Aviation Renewables has received an additional order to supply multiple units of the Solar Series LED Hold Position Lights (HPLs) to an Air Force base in the United States. Supplied by its US partner, Flight Light Inc., the Solar Series LED Hold Position Lights will operate 24/7, greatly increasing safety throughout the airfield for moving vehicles and aircraft. Aviation Renewables was tasked with the design of a solar airfield lighting system for the extension of the runway at Ogle International Airport, located in Guyana, South America. The solar airfield lighting system features advanced LED lighting and power solutions that operate from a radio frequency control system. Aviation Renewables has recently overseen the delivery and installation of two Solar Series LED Wind Cones at a civilian airport in the Caribbean. The Solar Series LED Wind Cones will improve safety of operations for both daytime and nighttime operations, and continues to be the world’s most-installed solar LED wind sock.